The national average wedding cost is $33,931. To estimate how much you’ll spend, get quotes based on your wedding style, date and location. Having a wedding isn’t as simple as saying “I do” — and it’s a lot more expensive. 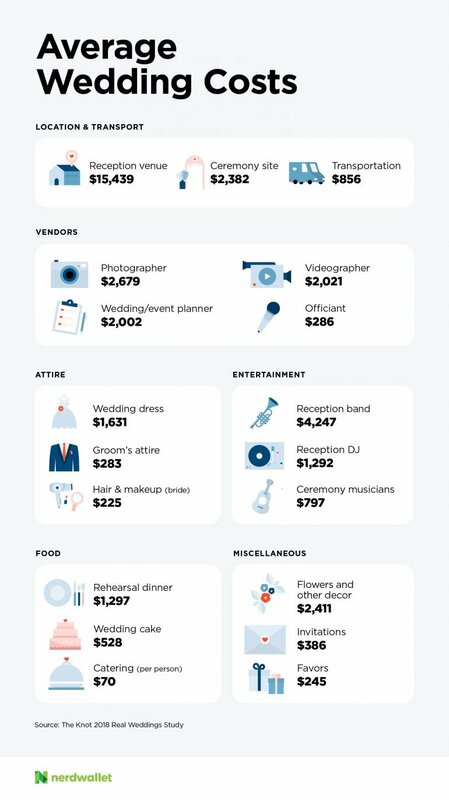 The national average cost of a wedding is $33,931, according to The Knot’s 2018 Real Weddings Study. Here’s what you should know about wedding costs and how to realistically estimate what you’ll spend to take the plunge. SAVING FOR THE BIG DAY? NerdWallet makes it easy to track your spending and can show you when to cut back and when to spend. At the very least, you’ll need a marriage license. Application fees vary by state, county, city or other conditions. The standard license fee is $27.50 in New Orleans, $50 in Boston and $100 in Santa Barbara, California. The $33,931 average is steep — and that figure excludes the honeymoon. But remember that averages don’t tell the whole story. Experts point out that they can easily be skewed. 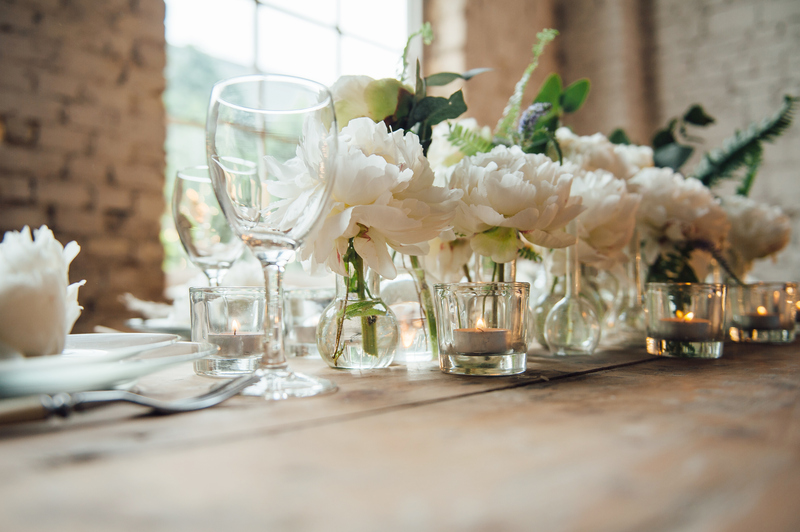 “One $1 million wedding can bring up the average of thousands of $10,000 weddings,” says Jessica Bishop, wedding expert and founder of the Budget Savvy Bride. One $1 million wedding can bring up the average of thousands of $10,000 weddings. So treat this data as a benchmark, not an expectation. And you don’t have to spring for all the items on the list. For example, you might decide to skip favors and hook your smartphone up to a speaker system instead of hiring a band or DJ. Hired help. Asking a friend to bartend and making decorations yourself are cheaper than paying for professional services and premium packages. Location. Where you get married matters, and not just for the venue. If you plan to tie the knot in a major metropolitan area, expect higher prices and increased competition for venues and other services. Guest list size. Some venues have minimum and maximum guest requirements and are priced accordingly, and vendors might charge per head for food and drink. Head count affects expenses across the board, says Deborah Moody, executive director of the Association of Certified Professional Wedding Consultants. With 10 fewer guests on your list, Moody points out, you’d cut out at least one table: That’s 10 chairs, 10 place settings, 10 favors and one centerpiece right there that you’re not paying for. “By cutting your guest list by 10 or 20 people, you may actually save yourself $1,000,” Moody says. Season. That sunny summer wedding probably comes with a trade-off: price. Ceremony sites, reception halls and photographers are known to offer lower rates during off-peak months, such as January or February. Day of the week. Saturday is the most popular day for weddings, and high demand often comes with a higher price tag. You might be able to save by scheduling your big day on a Sunday or weekday — unless it coincides with a popular holiday. Once you’ve picked the services you want, the best way to identify fair prices and approximate the total bill is to ask around. Talk to friends and family who’ve recently gone through the process, or consult a wedding planner. Get quotes from multiple vendors. Then choose the options you think are the best value. Get quotes from multiple vendors and pay attention to what’s included in the fees. As you shop around, pay attention to what’s included in the fees. Some venues provide tables, chairs, linens and audio equipment at no additional cost. Others charge extra or require you to rent these items from outside sources. Compare apples to apples as you evaluate costs. If you find it necessary to negotiate, do it carefully and respectfully. “You don’t want to nickel-and-dime a professional person who has set their rates the way that they’ve set them for a reason,” Bishop says. She adds that vendors just starting out in the business usually charge less than those with more experience. If you have a wedding planner, he or she should know what’s reasonable and where to find wiggle room, Moody says. “If you can find a place where they can do the wedding as well as the reception, then they should be willing to give you a break on the price,” she says. You can also lower rates on your own. Consider asking vendors to cut back on what’s included in their packages. For example, ask the photographer to work a few hours instead of the whole day, or find out if the caterer can limit guests to one or two drinks instead of offering an open bar. Even with careful planning, surprises are bound to pop up. Bishop suggests allowing for a 10% buffer to cover hidden fees, overages and add-ons, such as cake cutting and delivery fees, taxes and gratuities. Don’t bow to pressure from relatives, friends, social media or spending reports. Your wedding spending should align with your income, regular expenses and other financial goals. Once you’ve established a budget, decided the kind of wedding you want and begun to compare costs, plug in the numbers. Use our calculator to help you figure out what you’ll spend overall.